It has been an intense week at arki_lab, where we have been preparing for the final exhibition, which was successfully completed yesterday at Louisiana Museum of Modern Art. We had 170 students from five schools from Fredensborg municipality at the opening to see their own contribution to the project “The Architecture Around Us – a collaboration between arki_lab and Louisiana Learning. Since August students have been on fieldstudy in Copenhagen, having workshops by arki_lab at their schools , – and visited Louisiana, where they got inspired by the architecture and the current exhibition African – Architecture, Culture and Identity. The school project is based on an understanding of knowledge as something acquired through experience, and an active involvement in the world around students. Beyond the purely architectural skills and insights, students achieve an understanding of the importance the process oriented learning. The students’ own local environment are brought into play, and arki_lab contributes to academic and educational grip that offers new opportunities to create valuable learning through project-based architectural and urban processes – Our hope is that the students will have new tools on how to engage and impact their local area. We want them to know that their voices are valuable, and that you can change things for the better if you do it together. “The arki_nopoly game was nice because it made it more interesting to learn about new stuff – by taking it more step by step in a creative way. It was great that it was not so goal oriented and competition minded- it was not about getting better, but instead about changing the local area together”. “We were able to think in a different way, be creative and let the inspiration flow. It was nice that we were able to have an opinion about what we wanted in the local area, so it could be better place to stay. It was funny, inspiring and also a bit confusing because we did not always know what we should use it for. “It was nice to build something yourself without any limits, and I really liked to play with the boxes because we got outside and could use our hands and was free to do what we wanted to”. “It was very different and nice that it was exhibited at Louisiana, where I could see the process more clearly. The project also helped me to see Louisiana in a new way”. We hope to see you at the exhibition that will run until the 25 of October, where thousands of visitors will pass trough in the next couple of weeks. 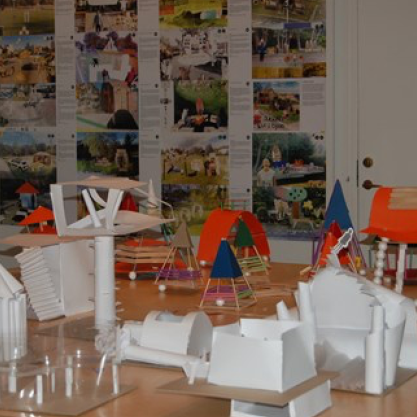 Thanks to all the students and teachers and to #‎statenskunstfond #‎huskunstnerordningen for making the collaboration between Louisiana Learning, arki_lab and the five schools possible!